This past Saturday, I traveled to the corner of Timberwood Trail and Bushy Cook, where I was treated to a special tour of Timberwood Organic Farm. Lucy led the tour and I can tell you she knows her way around the snap peas and carrots. Lucy's mother, Martha, is the farm's manager. Martha delivers Lucy to Ms. Rose and Ms. Susan's room AND she delivers fabulous produce to Chef Nate. While I was at the farm, I got a chance to say hello to Ray, who is the owner of the farm. You received an email from him in February explaining how CSA works and how Timberwood functions within CSA. If you missed the email you can go to their website at www.timberwoodorganics.com to read all about it. “The history of CSA traces back to Japan in the mid 60s when homemakers began noticing an increase in imported foods, loss of farmland to developments and migration of farmers to the cities. In 1965 a group of women approached a local family farm with an idea: multiple families would commit to support the farm and the farm in turn would supply the families with fresh vegetables and fruits. Thus the concept of community supported agriculture was born. In a nutshell the philosophy behind the concept is in the term that originated it, teikei, or "food with the farmer's face on it" CSAs didn't come to the US until the 1980s. Today, the number of farms supported by local communities reach over 1000, increasing dramatically each year. CSA members everywhere are supporting regional food systems, securing the agricultural integrity of their region and participating in a community-building experience by getting to know who grows their food. If you would like to try the wonderful food from Timberwood Organics you can see Martha at the Eno River Farmers Market in Hillsborough on Saturday mornings. Their farm fresh products are also available at the Carrboro Farmer's Market and the South Estes Market in Chapel Hill. We all have choices to make about the kind of food we eat and where it comes from. I think a great choice is to connect to a farm and be a part of community supported agriculture. You can support your own health, support your children's relationship to nature, and be a steward of the land all at the same time. 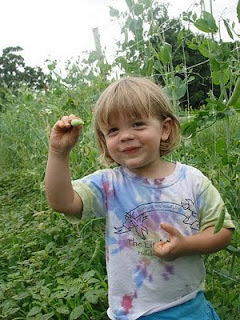 I think children have a natural curiosity about food, and children enjoy exploring food fresh from the farm. As children explore where their food comes from and develop a relationship with fresh produce, I think they are more likely to eat different foods and learn to enjoy them. Lucy showed me this critical connection first hand as she happily nibbled on her very own farm raised peas and carrots. I also got to meet Lily's family, who participates in Timberwood’s CSA. Lily is in Ms. Val and Ms. Wendy’s class. Lily's mother, Amy studied butterflies through binoculars, while Lily’s father, Andrew explained how to roast Kale chips. One thing that they have noticed since enjoying Timberwood’s harvest is how much longer it stays fresh (since it hasn’t traveled “forever” to get here!) Oh -- and imagine an in tact nutritional value! 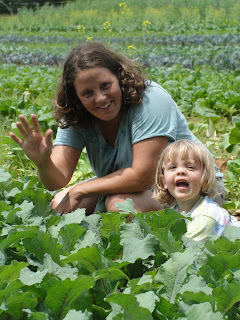 Explore our local farms, support our local farmers, eat kohlrabi and kale chips too! Remove rib of kale and chop up the leaves into normal chip size. Toss the kale in a bowl with olive oil and salt. Lay out kale on a baking sheet in a single layer. Bake about 10 - 15 minutes. You want to let the edges get brown and the kale to just become crispy. You can also add kale leaves to a smoothie! Use strawberries, blueberries, banana, apple, yogurt, honey, and a few kale leaves. You can add them in a few at a time and check the flavor. In a glass jar with lid, mix together oil, vinegar, sugar, and soy sauce; shake well. Combine the bok choy, onions, almonds, and noodles in a bowl. Toss with the dressing and serve.